The “Can Do” kids agreed that they all had enough of winter. There were just so many snow forts and snowmen they enjoyed making and snowball throwing that was fun. It was time for spring and sports. 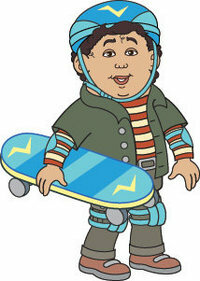 During the cold weather, Hector practiced his skateboarding in the basement of his house; he was getting ready for the skateboard race during spring break camp at the recreation center. The problem was…his basement just wasn’t that big. Before he could get up any speed, he would be up against a wall. The cold weather found Kathy practicing her jump rope in her basement. She had her problems too. The floor was slanted and made jumping a real challenge. 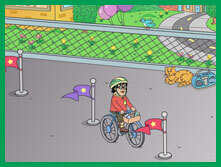 For Yundi, the cold weather forced him to practice for the bike race in his driveway. He had a hard time balancing himself with all the clothes his mom made him wear while riding. Also, the driveway wasn’t long enough to get any speed or practice sharp turns. Annie was lucky; the cold weather didn’t stop her from keeping her basketball skills up. She just practiced indoors at the recreation center and she has a hoop in her garage. She was ready for the outdoor hoops tournament at spring camp. Jay, like Annie, would be ready for his tournament at spring camp. He had been playing table tennis and winning all winter long! The same was true for Orrie, who had been keeping up his horseback riding skills all winter at the indoor riding ring at the local riding stable. On the last day of spring camp, in the afternoon, a bus would take Orrie and the other “Can Do” kids to the riding stable where Orrie would participate in a riding event. All the other campers would be there to cheer him on. Willie, Bobby, Arthur J, Nellie, and Wendy had been practicing their ball throwing and catching in the recreation center gym. However, they didn’t really have space to practice their running or hitting skills. They really needed to get on an outdoor playing field! The warmer weather couldn’t come soon enough for the “Can Dos” . They couldn’t get outside soon enough to get ready for the spring tournaments. How about you, boys and girls? Are you ready for spring and sports? Do you need to get outside and practice to be able to compete? The “Can Dos” were reading when there was a knock on the door of their classroom. All heads came up from their books; all eyes were on the door. When the door opened there stood Grandma Jean. Now the “Can Dos” were really curious. The only time Grandma Jean ever came to their class was to read them a story, but that was usually on a Thursday, and this was a Tuesday. Well, some of the “Can Dos” nodded and others didn’t look as if they thought it was such a good idea. “Hector said,”Ive got plans. Besides, I can see my grandma on Saturday and give her the valentine I made for her.” A couple of the other “Can Dos” agreed with Hector. Grandma Jean reminded the class of all that the seniors do for them year-round such as helping them decorate for their parties at the rec center, fixing the food for their annual picnic and the indoor camp sleepover. Why how would they be able to hold their meetings of the “Can Do” Kids Cooking Club? Who would cut up the fruits and vegetables for their recipes, and help them with cooking and baking? Who indeed. Wendy and Yundi and Jay each agreed to be a Valentine’s Day partner for a lady who did didn’t have a grandchild to share with at the Senior party. Orrie raised his hand and said, ” My Grandma Maureen has so many grandchildren, I know she would be proud if I kept another lady company at the party.” Grandma Jean and Miss Pat told him that was a very kind thing to do. Grandma Jean handed them each a Valentine’s Day card and the name of a Senior who would be their partner. As she got ready to leave, Grandma Jean handed out invitations to the party. A big whoop went up when the “Can Dos’ saw what was on the menu…strawberry smoothies and individual chocolate heart cakes. They would be making heart shaped cookies to bring home as their Valentine’s Day gift for their moms. There would be prizes, and picture taking and games! After Grandma Jean left the “Can Dos’ all agreed that being nice to others is not only a good thing to do, it can be fun! ____________is the “Can Do” usually seen dribbling a basketball. ____________and __________live with their grandma while their mom is in the Army. ____________is the smartest kid in class. ____________ is the school nurse. ____________is grandma of Kathy, Annie, Arthur Jay, Bobby and Orrie. ____________visits his grandparents on the Indian reservation every summer. ____________is the coach who helps the “Can Dos” with being good sports. ____________is director of the recreation center and grandma to Yundi and Wendy. ____________is good on a skateboard but has trouble sharing. ____________always carries a note pad and wants to be a writer when she grows up. ____________rode in an ambulance when he fell off his bike. ____________got lost, but Grandpa John and Policewoman Paula helped her. ____________is Nellie and Willie’s grandpa. ____________is the “Can Do” kids teacher. ____________is Hector and Maria’s grandma and an EMT. ____________is the service dog’s name. Yundi and Wendy’s grandma is coming from China for Sun Nin, the Chinese New Year! They told Miss Pat, and she suggested that they do a “show and tell” about Chinese New Year for the class. They agreed! They always listened respectfully when their classmates spoke about their holidays; it was nice to be able to talk about their annual holiday! The morning of their “show and tell” Yundi and Wendy brought in some pictures of decorations popular for Chinese New Year. They put the photos up around the classroom, and then took their places in the front of the classroom. Miss Pat nodded for them to begin. Yundi began, “Chinese New Year is a moveable holiday because it is celebrated according to the ancient Chinese lunar calendar. It takes place somewhere between January 21st and February 20th. The celebration may last for a week. Each year is named after one of the 12 animals on the Chinese Zodiac. Some people think that a person born in a year dedicated to a certain animal will have that animal’s characteristics. Then Wendy took over, saying, “Chinese families make many preparations for the Chinese New Year. Everything must be very clean. Special foods are prepared. New outfits are bought. Any debts are paid. Everyone gets ready to start out fresh and new. Red and orange are the special colors used for decorations. There are special scrolls everywhere with good wishes written in Chinese characters: Good Health, Long Life, Luck, Prosperity, and Happiness. 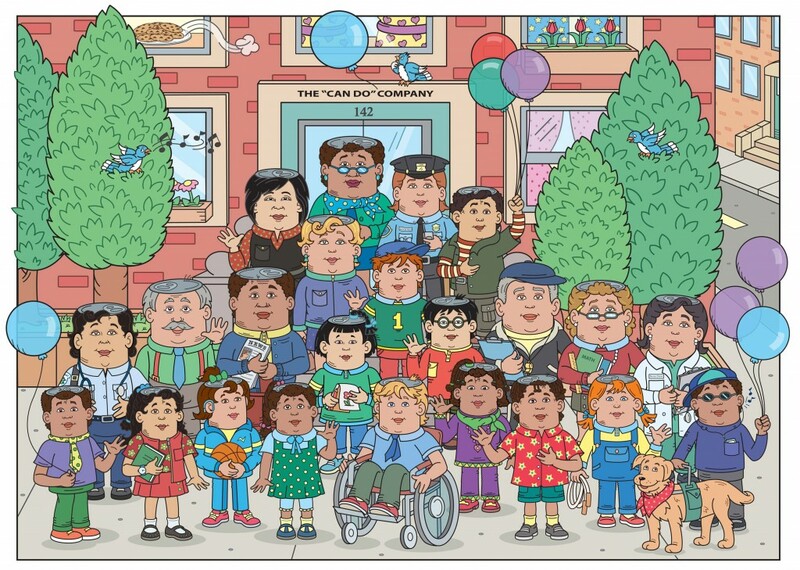 This day is everyone’s birthday party because Chinese people add a year to their age on this day no matter when they were born. Gifts are given. Children are allowed to stay up late on Chinese New Year’s Eve. They are given gifts of money wrapped in red paper. At midnight firecrackers are lit to scare away the bad spirits. Yundi finished their talk by saying, “On New Year’s Day everyone is very careful to be good and polite because they believe that the way they act on New Year’s will count in the year to come. Everyone visits friends and relatives and attends celebrations in the community. 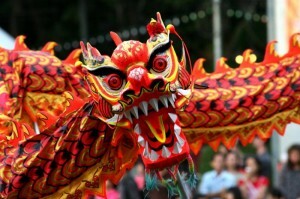 They may see the lion dance and the dragon parade, which bring good luck and prosperity. Just as Yundi and Wendy were finishing their talk, the classroom door opened and in walked their mom and their grandma, all the way from China! Everyone clapped, Wendy and Yundi ran up to their grandma and gave her a big hug. Then grandma opened the big basket she was carrying and offered each of the “Can Dos” a traditional Chinese New Year treat…an orange and a fortune cookie!